2018 Disneyland Candy Cane Dates Announced!! Are visions of Disneyland Candy Canes dancing in your head?? I hope so… because we’ve got the scoop on the famous Hand-Pulled Candy Canes returning SOON for the holiday season in Disneyland Resort! Keep reading for all the WHENS and WHERES for 2018! 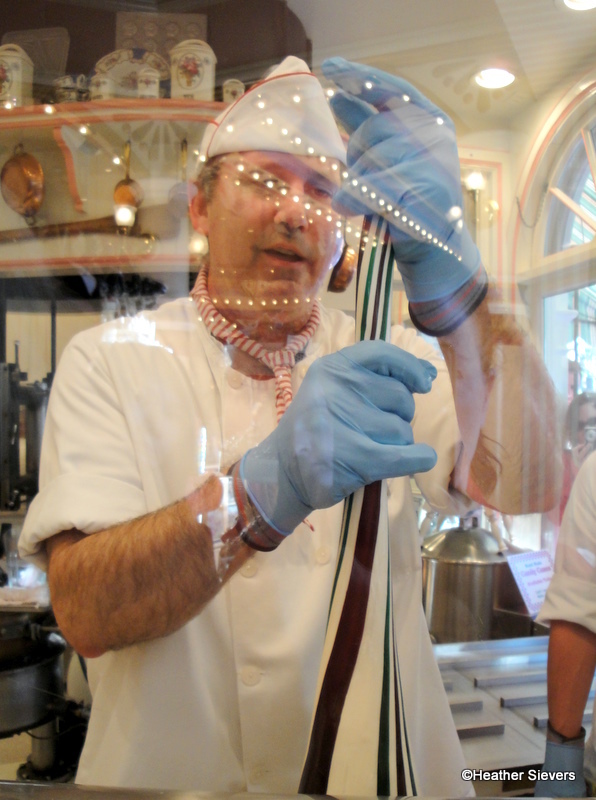 Hand-Made Candy Canes in Disneyland! If you’re not familiar with this Disneyland tradition, you can learn all about the Disneyland Candy Canes by clicking here! 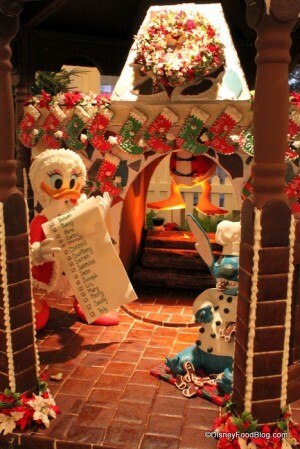 Dining in Disneyland: 2013 Disneyland Candy Cane Dates!! It’s about that time of the year! The Christmas decor is being put up around the resort and seasonal treats are starting to surface! 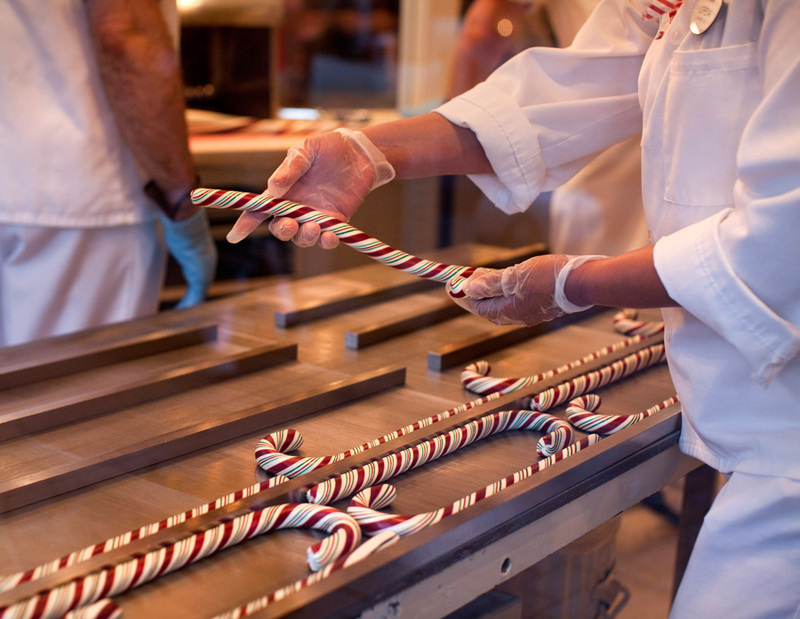 Are you craving Hand Made Candy Canes from the Disneyland Resort yet? Yes? Good! ‘Cause we’ve got the dates! Not sure what we’re talking about? Check out this post that showcases our first candy cane adventure. 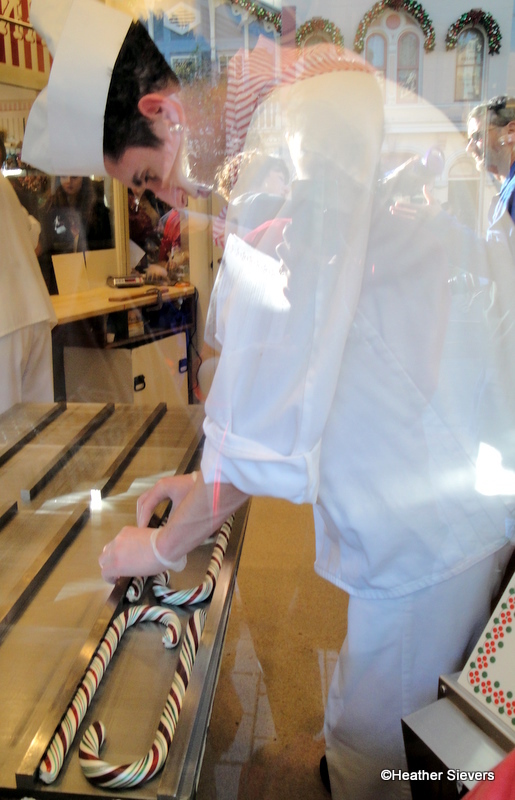 Just like last year, Candy Cane making will be alternating between Candy Palace on Main Street USA in Disneyland and Trolley Treats over on Buena Vista Street at Disney California Adventure. Technically you are not supposed to line up before park opening, but guess what people do? When I went for the first time, I was lucky and got there just 30 minutes before park opening. But I talked to someone who was there by 4:00am, which to me is nuts. So basically, it’s your call. Last year, the crush wasn’t quite so bad, but you never know what’s going to happen this year. Wristbands may be picked up at park opening. There will be 40 wristbands per batch and three batches per day. This means that 120 wristbands will be given out at park opening. 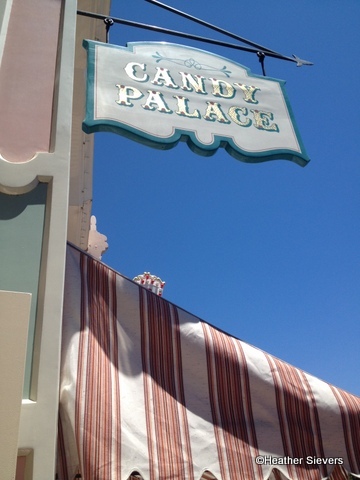 The Candy Palace is always one of my favorite stops when visiting Main Street USA at Disneyland. On a recent walk through, I noticed an exciting new addition to the check out counter; Candy Sticks! I immediately gravitated toward them because they reminded me of a very special holiday treat. 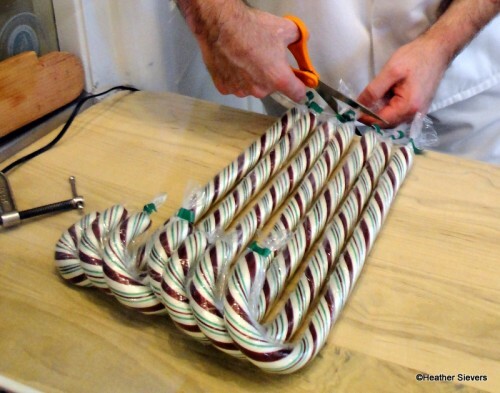 Yep, Disneyland’s famous handmade candy canes. Same width, same patterns, and same packaging, but less than 1/2 the price! New for Summer, the candy sticks are made in the Candy Palace kitchen using the same process as the Disneyland candy canes. 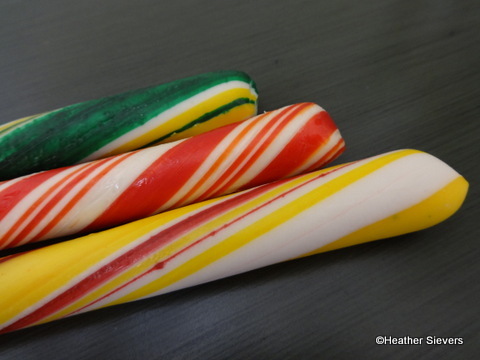 Each stick is generous in size, basically one of the giant candy canes minus the hook! They are $4.99 each, and come in three flavors: orange, lemon lime, and cinnamon. Unfortunately, because they are handmade, you may not use your annual pass for a discount on these puppies. There is however no limit on how many you can buy. Of course I had to buy one of each flavor and take them home for experimental research! When I got them out of their packages, I noticed that they had the same light and airy feel to them as the holiday Candy Canes. Guess what everyone!?! TODAY marks the first day to get your hands on The Handmade Candy Cane: Disneyland’s hottest holiday commodity. For those of you who aren’t aware of Disneyland’s Handmade Candy Cane tradition, you can read all about the Race for Handmade Candy Canes here. Things are a little different this year! 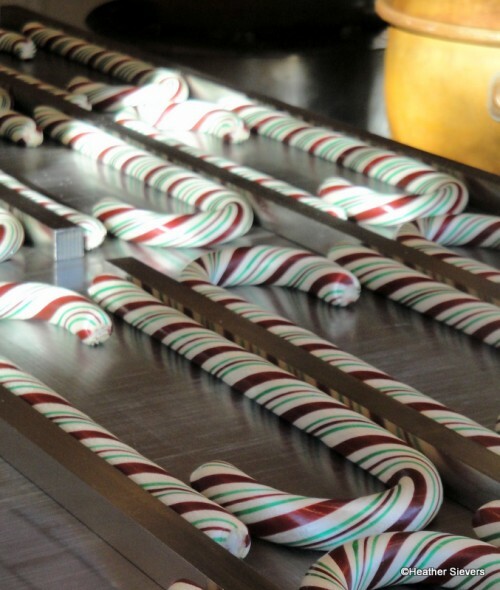 The biggest news of the season is that Candy Canes will be made in BOTH Disneyland and Disney California Adventure. This means twice the candy cane fun. Candy Cane making will be alternating between the two parks, as often 4 days a week. 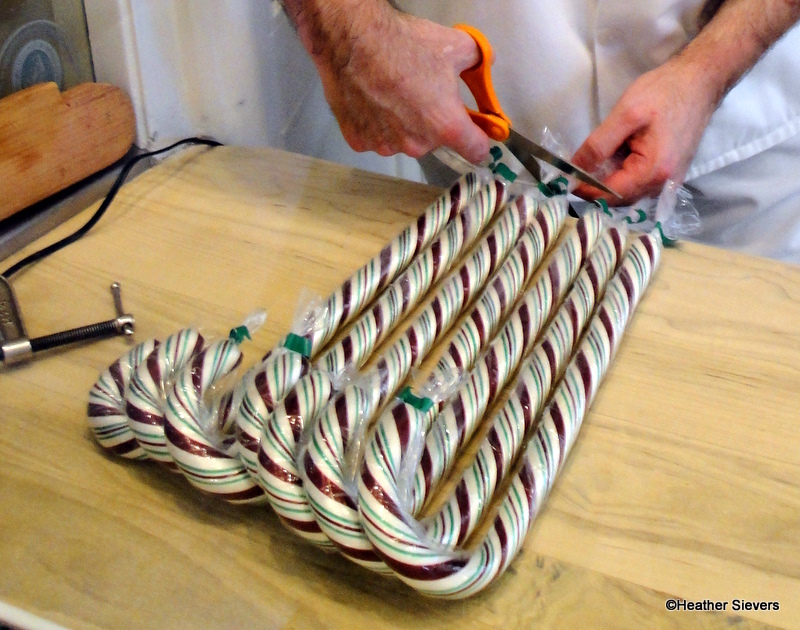 At Disneyland, the Candy Canes will be made at the newly renovated Candy Palace while over at Disney California Adventure, they will be made at Trolley Treats. Ready for their new homes! Technically you are not supposed to line up before park opening, but guess what people do. When I went for the first time, I was lucky and got there just 30 minutes before park opening. But I talked to someone who was there by 4:00am, which to me is nuts. So basically, it’s your call. Wristbands may be picked up at park opening. There will be 40 wristbands per batch and three batches per day. This means that 120 wristbands will be given out at park opening. The earlier you are there, the earlier your batch. Your wristband will get you ONE candy cane. If you have people with you, you HAVE to be together as a group. They will not hand you wrist bands for anyone who is not with you. Your wrist band will have the date and batch time on it. You may pick up your candy cane any time after your batch time. Your wrist band guarantees you your cane, but you must pick it up by 4:00 or it will be sold to someone in the stand by line. 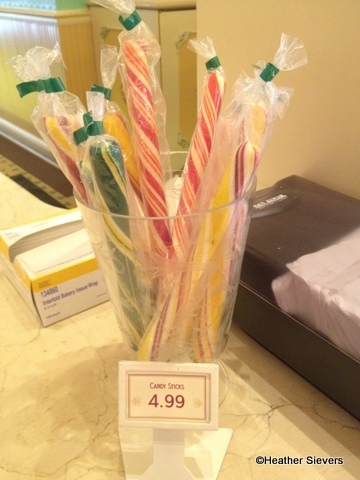 Last year candy canes were going for $12.95; I am not aware if there has been a price increase or not. ANNNND. Something I found very interesting when I went and checked each day’s park hours… No taking advantage of Early Admission Hours. The Disneyland Resort has purposely left out Early Admission Hours. So basically, the days the Candy Canes are being made at Disneyland, there are zero that have early admission hours. It’s the same over at Disney California Adventure. Disney food-lovers have lots to be excited about during the holiday season at Walt Disney World and Disneyland! From life-size Gingerbread houses to Candy Cane Fudge, the parks and resorts celebrate with sweet treats and special dining experiences! You may have noticed a new little holiday icon on our sidebar! That links to a page where we’ll be compiling all of our Disney World and Disneyland Holiday information, so if there’s anything you need to know — check there! For the third year in a row, we’re sharing the yummy offerings found only at the holidays, including some awesome reader suggestions for seasonal dining. The Gingerbread Displays are beginning to appear, too. All our favorites have returned at the Contemporary, Boardwalk Beach Club, and Grand Floridian resorts. We’ll tour them in the coming weeks! In Disneyland, the annual Candy Cane frenzy has begun. Dates can be found here! Also, sign up now to work on your holiday construction skills. 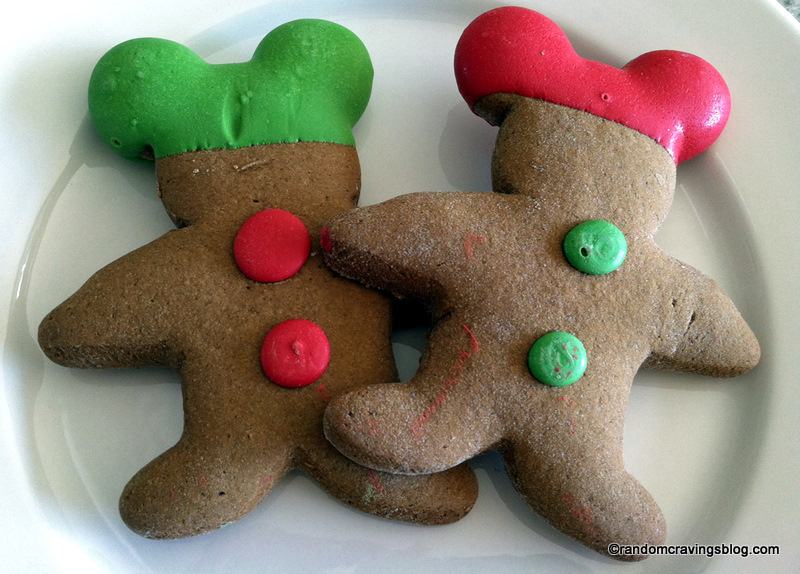 Ralph Brennan’s Jazz Kitchen will be holding gingerbread house workshops! From gift ideas to information on Holiday events, we’ll keep you up-to-date on our 2011 Holiday Dining Page. What’s your favorite WDW or Disneyland holiday experience? Let us know in the comments section! 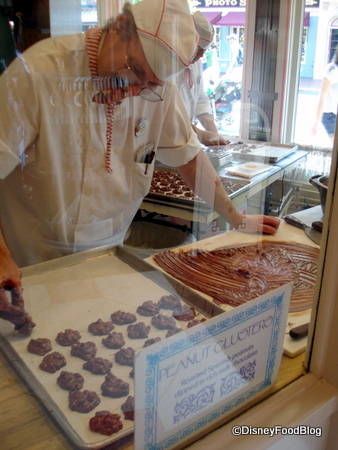 And if you’re in a Disney park or resort this holiday season and find something yummy, let us know and send over a pic! She gave you the dates of the 2010 Disneyland candy canes, and now she’s back…with the real thing!! Heather Sievers, our Dining in Disneyland guru, reports on the mad rush for canes at Disneyland’s Candy Palace! After hearing about Disneyland’s hand made candy canes, I put it on my bucket list. Something I’d have to do at least once in my lifetime. So, why not take care of it now and share it here on the Disney Food Blog? 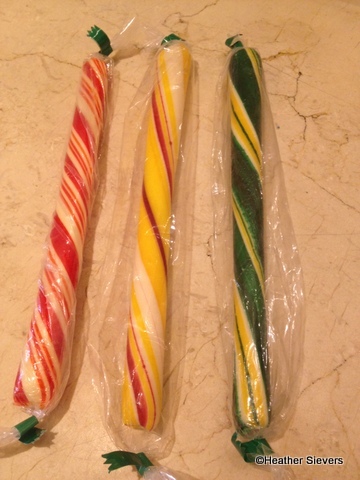 Our Disneyland Guru and columnist, Heather Sievers, checked in last night and discovered the dates that Disneyland’s Candy Palace is planning to make their famous Disneyland candy canes. It’s Disneyland Candy Cane time again! Last year, the canes retailed for $9.95. To find out when the canes will be made, call the Candy Kitchen menu line: 714-781-0112. Have you ever realized how many similar dining opportunities exist in Disneyland and Disney World? That’s what my colleague and friend, Ryan from Main Street Gazette, and I were discussing a couple of months ago when we came up with a fun idea. We knew we were both headed to Disney parks — he to Disney World, and I to Disneyland — and thought it would be an intriguing series of posts to compare our experiences at “mirror image” locations in Disney World and Disneyland! For the next month of Wednesdays, you’ll see us reviewing back-to-back, mirror image foodie havens in the Florida and California parks! Whether you’re headed to the East coast or the West, we’ve got your Disney Food needs covered — please join us for the ride! 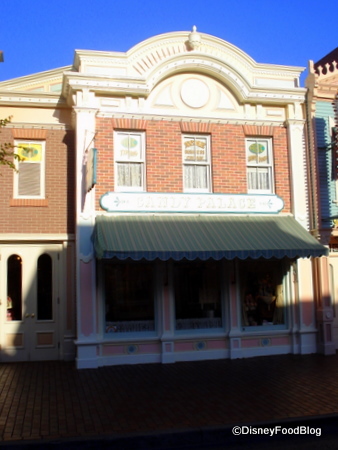 Today, we’re discussing the homemade goodies from the Main Street candy stores at Disney World and Disneyland, which means I get to talk about Disneyland’s Candy Palace! And let me say right up front — this place is all about the homemade! You know they’re famous for their homemade candy canes during the holiday season, but they’re making homemade candy — front-and-center — every single day of the year here.